Following its first official iPhone launch earlier this year, T-Mobile is experiencing another Apple-related first today. T-Mo is now selling both the iPad Air and iPad mini online and in stores, which marks the first time that Magenta has officially sold iPad hardware that’s compatible with its network. 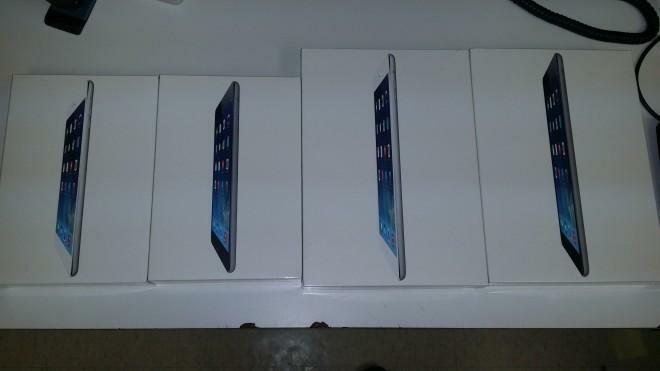 As you can see in the image above, passed along to us by an anonymous tipster, T-Mobile stores are receiving stock of both the space gray and silver versions of the iPad Air and iPad mini. T-Mobile is also accepting trade-ins of other tablets and giving out credit that can then be put toward the purchase of a new device. Both Wi-Fi and cellular-enabled tablets are eligible to be traded in, so anyone looking to make the jump from a Wi-Fi-only device to one with built-in wireless can take advantage of the offer. Oh, and don’t forget about T-Mobile’s Tablets Un-leashed promo. Magenta is giving every T-Mobile tablet user 200MB of free data each month for the life of their device, even if they’re not an actual T-Mobile customer, so that could be a good plan for light data users or anyone that wants to try out T-Mo’s network before signing up for a paid data plan. As far as those paid plans go, T-Mobile voice customers can add data buckets that start at $10 per month for 500MB and go up in 2GB/$10 increments. T-Mobile also offers daily passes that start at $5/500MB and weekly passes that start out at $10/1GB. Now that the iPad is officially available on T-Mobile and the Tablets Un-leashed promo is underway, do any of you plan on celebrating by picking up a shiny new cellular-enabled slate? will the hot spot feature be available on tmobile ipad air? What are the trade ins for ipad 2 wifi coming in at?? Called tmo and she had no idea of the ipad deal at all! Ordered the 32 gb. Not a bad deal. Lighten my load to Italia. The $429 price includes the 200 mb of data per month…forever. As an existing T-Mobile customer, adding the iPad 200MB plan adds a monthly $10 charge to my plan. That doesn’t seem free to me? If you select the $10 on-demand plan as a current T-Mobile customer, you will receive a $10 bill credit. I see that but when I ask for plan details it clearly says that plan is $20. You’ll receive $10 off the $20 plan which I’ve confirmed when I went to checkout. You’ll clearly see a $10/month charge for the data plan. You can verify this by selecting the 200mb plan and click on “details” you’ll see it says $20/month. I spent hours on the phone with 3 different Tmobile customer service reps, none of them knows about the 200mb free data for life. It is very frustrating. Can’t believe corporate didn’t roll out a ‘training’ program for their own workers. This plan is so new that they are clueless. The one I spoke with breezed right on by speaking about it and tried to upsell me a 2+GB plan. I don’t need it, and so I tactfully steered her to the 200mb promo and she said, oh yeah. She was very nice though and it may have been she was trying to give me what seemed a great data plan. So I’m at $26- mo on a 32 gb pad. All this while making espresso this morning. Not too shabby for a change. Their new web page is all screwy though. Wow! I was forced to get the 2.5gb in the store. I called customer service in the car and immediately changed to 500mb with the addtl 200mb. what i’m wondering is how there are all of these blogs posting about all of this “misleading information” in the new plan launch, and TMONEWS isn’t coming to defend magenta’s honor? Or at least make a post to get the facts straight? Ugh. David. Come back. Agreed. I do miss him coming to magentas defense. I don’t see what you are seeing. I selected the on-demand plan that is $10 with the $10 bill credit making it $0. Yes, John L tweeted, it’s a bug in T-mobiles system. I just picked up a T-Mo iPad Air. When I try to set up the Cellular Data on the device itself it recognizes my existing T-Mo account information, but then it wants me to set up a new email-username and password. I already have a my.t-mobile Login, but that doesn’t log in using email (just phone number). I don’t want to create a new login if it’s redundant so I’m a little confused as to what’s going on with that. Were you able to get the 200mb free once you set it up via the iPad? Because one cannot do that when ordering the item thru t-mobile website somehow. I bought the iPad at an Apple store (64GB). It came with a T-Mobile nano SIM pre-installed, but I’ve been having trouble getting it set up. Via the iPad, the setup has been recalcitrant and kept spitting out errors or pulling up obsolete billing information which it won’t let me change only to fail because of that. Now it won’t even let me get that far. I think I’ll have to take it to a T-Mobile store so they can set up the SIM itself. The farthest I got was picking the On Demand mobile broadband for $10/mo, and upon making it to the checkout it shows a monthly credit for $10, so the net cost is $0. ..and scroll to the bottom and expand the questions and answers. I have no idea how it works with prepaid or non-customers, but I’ve heard success stories on that front so hopefully it’s all good. Well, it seems my original reply never got approved. The long and short of its I haven’t had any luck. I got close on one try while attempting to add the iPad Air to my account via the iPad itself, but I keep hitting one error or another and now I can no longer get past the first step. The people at my local T-Mo store only told me they could literally do nothing. When I almost got it to work it wanted to add a $10/mo charge with a $10/mo discount on my account for a net increase of $0 dollars. John Legere recently tweeted that this whole mess is a mistake anyway. Perhaps I’ll just sit tight over the weekend and try not to freak out. If anyone is trading in a tablet today, please let us know the trade-in value for it. I’m planning to trade in my 1st gen Nexus 7 for an iPad mini w/ Retina. never trade-in! never never never. How much credit would tmo give me for my 7 inch wifi only kindle fire hd? I would like to trade for a tmobile nexus 7. It’s all well and good that they have pricing on 64GB units, but T-Mobile didn’t appear to get ANY of them, either in-store or online. And I’m still not getting one! Same here even tho my store in LA already has some and yes i can afford one im never getting an apple product again. I know it says 0 down for the 16 gb pad, but TMobile will collect the sales tax on the total price of the pad you buy if you’re in a taxable state. Of course you pay taxes on the total price. Don’t like it? Lobby your state representative to have them create an EIP on sales taxes. These marxists love taxes. The height of their innovation is how to create a new tax. Now it’s black boxes in your car to record how you drive and tax you for it. It never ends. My expense is a business expense, so I’ll get mine later. The storage extortion game has to stop. The practice of OEMS building devices with no microSD port and then charging consumers ridiculous sums to up the internal storage. $100 for an extra 16GB? Really? I agree, but external SD memory is extremely unreliable. i like what HTC and LG did by starting at 32GB for the one and G2. seems fair. I guess experience varies. I haven’t had any trouble, but i stick to class 10 and name brands. I can understand wanting to markup storage, however these margins are crazy. And, yes, 32 GB is a good standard. I have a 16 GB phone and i have to keep my music in the cloud. That can be an annoyance if you rely on a cellular connection. I’m actually contemplating getting an iPad Air…. Though I really hope T-Mobile brings in the 2014 Note 10.1 I’d be all over that! I 2nd that! I’ve yet to find a tablet as nice and as powerful as the Note 10.1. I have the HP Touchpad with Android on it. Works great. But heavy and not as thin. But I also got it for $99- I did order the 32 gb ipad air in gray today. Awesome! I wish they had more stock in store. I tried three Tmo stores before I found one with any stock! They all wanted me to order but I wanted one immediately. Didn’t help that I’m vacationing in a rural area!! Hey at least I have usable Edge here..enough to stream iheart. 32gb sounds awesome thou..I wonder the monthly on that? Ordered the iPad Air online and chose the on-demand data pass. I never saw anything about the 200MB of data for life, but honestly I wasn’t looking for it/caring either, since I’m just intending to tether to my phone(4.5 gb of data with tethering for 20 bucks a month? No-brainer for me).. This is gonna be my first iPad, I hope what I keep reading about it having the best tablet apps is true. Seems like a pretty awesome piece of hardware, looking forward to comparing the experience to my Nexus 7 2013. Why not get unl data + 2.5GB tether for $20? Ah ok, it’s the opposite for me. I use over 10GB per month on my phone, and around 500MB via tethering. Waiting for the Mini Retina myself. I’ve heard the iPad Air is as light as the original Mini though. I’ll have to stop by an Apple Store to try one out. Never owned an ipad before , with no usb on them what is the best way to load movies on them ? guess we will have to wait and see. Hey Conan are you replacing David? When is the 64GB air going to be available? There’s only 16 and 32GB for purchase on their web site now. Since I was already planning on picking one up and tmobile is charging the same price as apple, I see the free 200mb as win win. I’ll see if any local stores have the 32gb tomorrow. ivan, when you log-in and add the plan to your cart the 64gb model shows up as an option but in white only. Hey guys, David is now blogging at 9to5Google.com if you’re interested in keeping up with him. 9to5Google guys. You’ll be surprised who is there. My comment was deleted earlier and I know why. If it gets deleted again so does this bookmark. NO iPad Air’s that are WiFi only??? WTF? Why the heck would T-Mobile sell wifi-only tablets? That would be like being able to walk into a Comcast store and buy a Roku streaming box. Yeesh, use your head a bit. Simple, random ole boy. If, I had NO USE for cellular in my iPad because I have tethering enabled on my T-Mobile cellphone already, why wouldn’t I save myself $150 bucks on my new iPad ?? Just good sense … Don’t you agree ??? Guess you missed the whole John LeGarre thing over the last few months… He does NOT give a single crap about what others perceive his business is… He cares what his customers tell him it is… Refreshing… Since I have WiFi hotspotting on my cell FOR FREE, why would I waste the money ??? And my local T-Mobile people just told me they would be available in the stores tomorrow ….. So you’re saying that if you as a customer demand that T-Mobile started selling cars, then because of John LeGarre[sic] they would do it? Also, I’ll believe that T-Mobile will sell wifi-only tablets when I see it, regardless of what a retail store rep said. If that happens, I’ll gladly eat my words. Edit: as a disclaimer, I agree with you that John Legere is taking the company in a great direction and that he does listen to customers when their requests make sense from a business standpoint as well(or if he can make it fit into something that does make sense). I don’t think that requesting to buy wifi-only tablets makes sense, especially since customers that just want to use tethering can go to their local, friendly Apple store for their new wifi-only iPad Airs. Cool , so if i understand you correctly i can get a wifi only ipad mini with retina coming soon at a T-Mobile store when they release . I’m with you , why pay extra for the cellular model included when my phone allows me to have up to 5 people at once hotspot off my phone for free. Has it ever occurred to you that people already have wifi hotspots in their smartphone that they can enable to use with that wifi only tablet. And they are already paying T-Mobile for that data service so T-Mobile will not be losing any money from it. So T-Mobile’s primary goal of cellular service has already been met. Yes it has occurred to me, and you might notice in my previous post on this article that I’m doing just that with my new iPad Air. But I still got the cellular model from T-Mobile because of the attractive financing option. Has it occurred to you that T-Mobile has nothing to gain by selling wifi-only tablets? Basically this suggestion would mean that instead of financing a 650 dollar phone per line, they would be financing a 650 dollar phone AND a 500 dollar tablet per line. Now which makes more sense, financing all the equipment on one line or forcing another line of service if they want their tablet from T-Mobile? Has it occurred to you that the Customer is what makes or brakes the profits T-Mobile seeks by what they choose to buy. Why would they buy a higher priced tablet to do the same thing ? What’s the point in advertising all the things a premium smartphone can do with it’s big HD screens and LTE data speeds with hotspot capabilities if you can’t use the phones full data capabilities without having to buy the high dollar cellular tablet to do so. In the end T-Mobile is still making money , do you honestly believe their selling those devices without making any profit . We’ll just have to agree to disagree here. If you think its really a smart business move, you’re welcome to that opinion. I strongly disagree. Additionally, I never said that T-Mobile doesn’t make any money from just selling the tablets, but it’s peanuts compared to the recurring revenue an additional line of service brings. And, again, there’s nothing stopping customers from getting WiFi tablets from the Apple Store or Best Buy or anywhere else and then using the hotspot on their T-Mobile phones to share the data. T-Mobile has damn near zero reason to sell wifi-only anythings. This is not a make or brake[sic] issue as you claim because, again, the primary thing T-Mobile sells is service. Consider this: if T-Mobile sold wifi-only tablets, it wouldn’t just mean that the people who were going to go that route anyway would be able to buy the tablets from T-Mobile. It would also mean that the customers who were on the fence about whether to get a cellular tablet and another line of service or not would actually be discouraged from doing so. “Oh, I can just pay you 21 bucks a month for the tablet and use tethering without getting another line?” Again, great for the customer, but terrible for T-Mobile’s bottom line. I firmly believe that any customer goodwill for something like that would be vastly outweighed by the lost revenue. LOL , I just noticed that too. Lets agree to disagree , probably the best ending. There are no wireless carriers that WiFi only tablets. They make money off the lines of service. Not so much the hardware. Sorry, you are simply… Wrong. hes not totally wrong. tmobile wouldn’t care to sell ipads as ipads. they are a wireless carrier, not an electronics retailer. the revenue comes from the service – that which comes from the device is negligible. are you trying to assert that t-mobile is heading in a direction of being a full-service mobile computing supplier? wrong. they’re a wireless provider. Ask John… He may disagree with you. Mr. Legere is taking the company in an amazing direction, but you’re stretching that pretty thin here. T-Mobile is still a service provider. Your 7-11 comparison doesn’t make any sense either. It seems more like you’re the one not thinking beyond the transaction at a retail counter. Take your business elsewhere because you can’t get a wifi-only tablet from your CELLULAR service provider? Good luck finding ANY cellular service provider that will sell you one. I dunno, man. I’ll keep an eye out, but even if I did see it, I still wouldn’t think of it as a good business decision on their part. Why discourage people from getting another line of service by carrying the wifi-only tablets? A few people here and there saying “good on you, T-Mobile?” Compared to all the lost revenue from people just buying the wifi tablet and skipping the extra line of service? Just doesn’t make any sense to me. But I suppose if anyone would try it, it would be T-Mobile. Let’s take a look… The cell companies had a monopoly so long on you and I picking up the ONLY tool we could to call granny from a road trip back to Ames Iowa… NOW, we got Skype and a million other VOIP solutions that the cell boys don’t play in AT ALL!!. A LOT of the two-way interaction is now via test message – much of which doesn’t go they cell companies any more.. THAT was a huge hit to their profitability ..….WWHHAAAaaa… The proliferation of WiFi and it’s derivatives are so pervasive, cell companies aren’t getting any of that either.. I got all these Cell radios in my mobile for data that I DON’T NEED… The manufacturers have got it already covered with other alternatives… SO, Cell companies gotta do SOMETHING – or PERISH !!! John over at T-Mobile is doing EVERYTHING he can to poke an un-sealable leak in ATT.. He may succeed …. BUT, he also knows he has to do other things with his company if he’s gonna be around in 5 years. ATT, Verizon, and Sprint have NO CLUE how to compete with him yet and may never…. But John hasn’t got the market cornered on smart people so others will gain ground. So, the message is be willing to speculate, be outrageous, DEMAND MORE of a cellular provider than just towers and bars…. That’s boring… FORCE THEM to be more. We just gotta keep kicking them down the road… They sure as heck won’t move without us… BUT, the tech companies a forcing them to get more and more and more innovative to keep up with the advances in technology…. Mention one wireless carrier and the device. That’s the dumbest comment I’ve seen someone make. Why would they offer WiFi only tablets. They are a wireless carrier not a big box retail store. A WiFi only model doesn’t benefit them as much as a cellular model would. Plus they have goals they need to hit on a monthly basis for MBB so that would only hurt the retail stores. Now if they were to offer it as strictly an online only option I would understand. Too much overhead in the stores for what little they will make off of it compared to a cellular model. If tablets had higher margins it would make sense but we all know they do not. Can I still get the unlimited data if I bought an iPad Air from AT&T but get a TMo SIM later or do I have to buy the iPad directly from T-Mobile? Keep in mind that T-Mobile doesn’t offer unlimited full speed data for tablets. But if you’re asking if you can still get the plans that are “unlimited” in that they are throttled to 100kbps with no overage charges after hitting the full speed limit, then yes. Starts at $20 for 500 megs of full speed data per month. Doesn’t matter where the iPad Air came from as long as it’s cellular-enabled. Can I swap the iPad Air SIM back and forth between the iPad and my Nexus 4 (with an adapter) that I use as a data only device? If I buy data for a particular month will it add to or replace the 200 MB of data? For example, if I get the 2.5 GB data, will I get 2.5 GB or 2.7 GB of data for that month? yes you can, and replace. you will have 2.5. They offered me $47 for nexus 7 on trade in, no thanks !!!!!!! I decided I am going to wait on mini with retina display anyway. trade ins are never and never will be the best option for the customer. I just saw the iPad air in a T-Mobile store today. It’s fast, responsive, and very light. The design is just like a mini. But my one gripe is that it feels cheap and flexible – the screen, that is. I was all ready to trade in my iPad 3 but after seeing that, I decided to wait and see what else is coming out.